I have been eating the most delicous array of Asian fare ever since I’ve arrived in Singapore. It really is a foodie’s dream. And now that I’ve overcome my aversion to eating in shopping malls…if you can’t beat them join them and all that…I keep finding more and more gems. And with no real kitchen to speak of I’m certainly working my way through a few by eating out at least twice a day. Not good for my wallet but excellent for finding new dishes to recreate at home. So watch this space for some exciting Asian recipes…top of my list currently is to try recreate some of the xiao long baos – (otherwise know as steamed pork dumplings) – we had at Dim Sum empire Din Tai Fung last week. But in the mean time I have a couple more western recipes in the archives. Around this time last year I posted a recipe for a mozerella and red pesto burger and I’ve been meaning to post today’s recipe for brioche burger buns ever since. No burger can be a truly perfect burger without the perfect burger bun, which does, after all, constitute almost two thirds of the package that is a burger. When the Perky Kebab and I visited Califonia back in 2010 we experienced our first truly perfect burger at the divine Gott’s Roadside. Not only was the burger delicously juicy and on the right side of greasy, but the burger bun was a light, yellow hued and slightly sweet brioche bun. Perfection. So I was dying to recreate this at home. 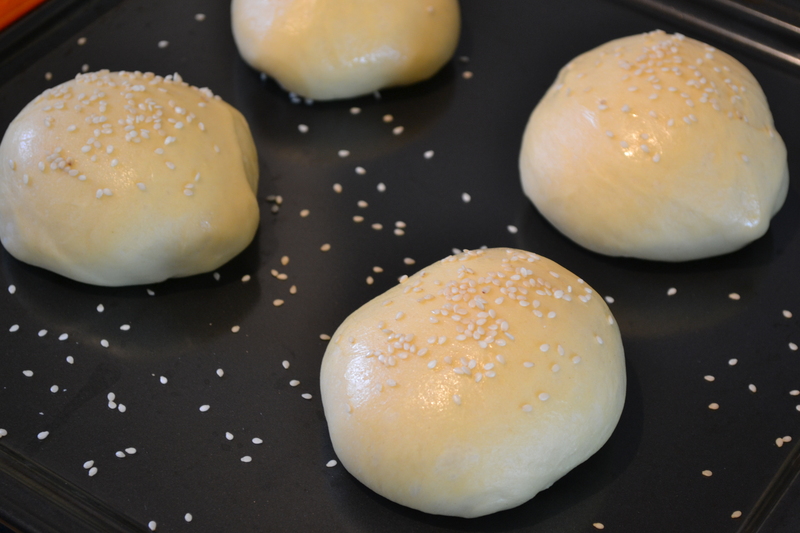 Luckily Deb Perelman of the Smitten Kitchen came to my rescue with her recipe for light brioche buns. As with most of her recipes, it is super easy and produces amazing results. 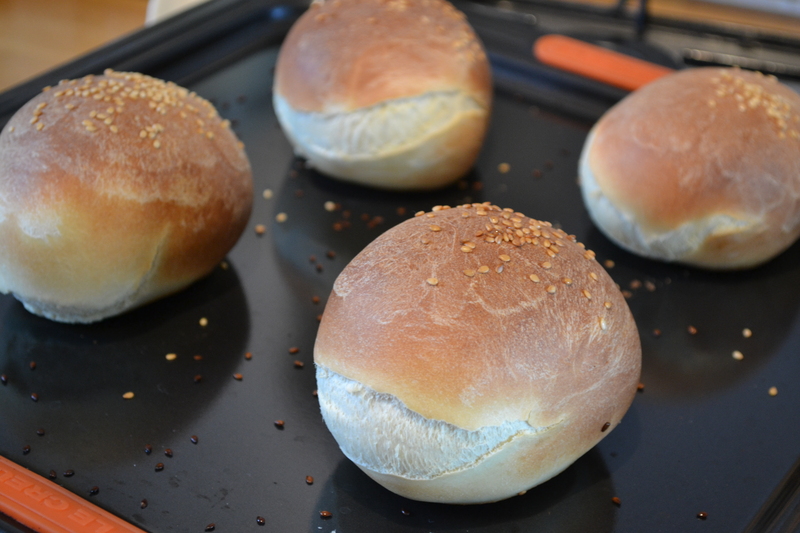 Light, fluffy buns that are slightly sweet and make the perfect house for a burger…meat, prawn or otherwise. P.S. The pictures above were my first attempt at these and I now make them much flatter so you can easily fit the whole burger in your mouth…I also use an egg wash not a milk one as in the pictures above to avoid them going so brown when cooking. 1. 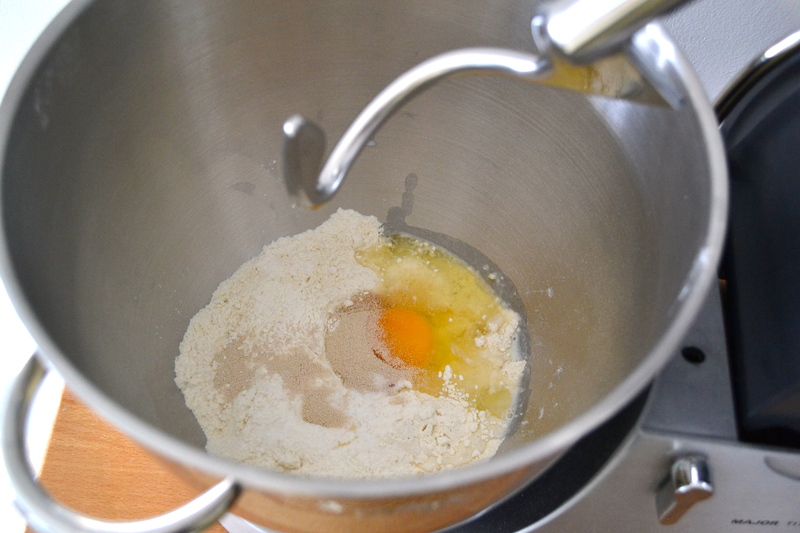 In the bowl of a freestanding mixer, mix the flours with the salt. Add the butter and rub into the flour between the tips of your fingers, making crumbs. Add 1 egg, the milk, yeast, sugar and 1 cup of warm water. Using the dough hook attachment, mix on a medium speed for about 6-8 minutes until it is smooth and elastic. The dough will be stickier than a normal loaf of bread – try to leave it as wet as possible. 2. 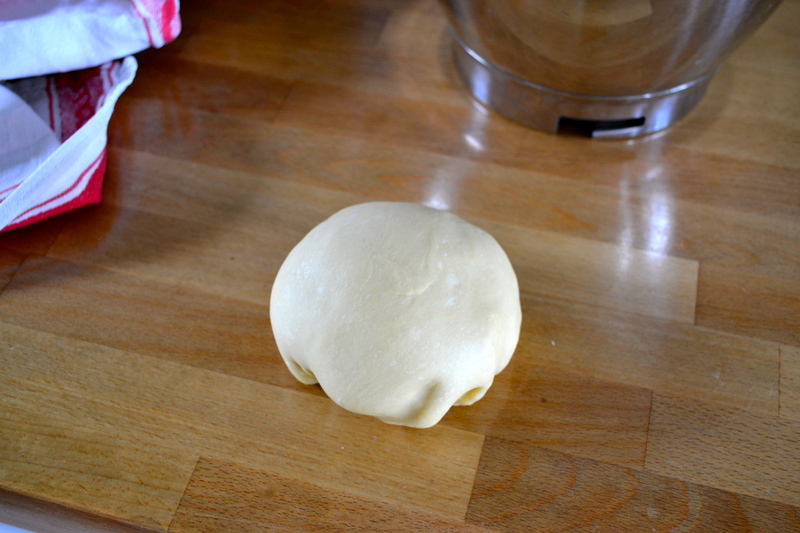 Shape the dough into a ball and return to the bowl. Cover with cling film and leave to double in size for 1-2 hours. 3. Line a baking tray with baking parchment. Once the dough has doubled in size, use a dough scraper or knife to divide it into 8 equal parts. Gently roll each into a ball and arrange about 7-8cms apart on the baking tray. Cover loosely with cling film or a tea towel and leave to rise again for a further hour. 4. Pre-heat the oven to 200°c/180°c fan/400°f/gas 6. Set a shallow pan of water on the oven floor. 5. Beat the remaining egg with one tablespoon of water and brush the top of the buns (I only had 1 egg and used milk which is why they are a bit darker in the pictures above). Sprinkle with sesame seeds if using. 6. Bake in the centre of the oven for about 15 minutes until the tops are golden brown. Leave to cool on a wire rack.